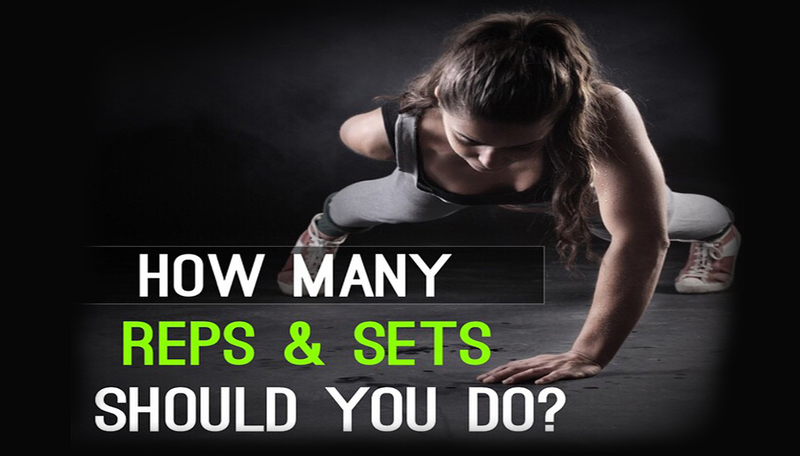 How Many Reps & Sets Should You Do? Posted byadmin	 8. May 2015 Leave a comment on How Many Reps & Sets Should You Do? For most people, it is best to start with one set. The repetitions should be high on any exercise. That means somewhere between 20 to 30 repetitions for approximately the first two weeks. This is necessary to build muscular coordination and allow specific chemical reactions to occur in the supporting tissues. You should always choose a weight that provides resistance but allows for all of the repetitions to be completed. Make sure that you can do one set of every exercise for every body part for 20 to 30 repetitions for at least two weeks before advancing to the next level. Children under the age of 18 should never lift over 50% of their bodyweight until they have achieved their tallest parents’ height. Diet has more influence on your body’s appearance than exercise. A half of a bagel is approximately 200 calories. Most individuals would have to run a mile at an intense rate to burn just 200 calories. Don’t take a pill to make up for poor eating habits. Our bodies come in 3 basic shapes: skinny, muscular, and plump. If you are a bodybuilder, then it is likely that you will need 4-6 exercises per body part. If you are participating in any other sport, usually two to 3 exercises per body part are sufficient. If you are untrained or a beginner, then one or two exercises per body part is sufficient. Finally the intensity of the exercise will also be based on the amount of rest in between sets. The untrained individual should rest approx. 60 to 90 sec between sets. The beginner should rest approximately 45 to 60 sec between sets. If you are just starting out, you can do one set per body part, performed 20 to 30 reps per exercise, and train all your body parts in one day. To achieve general fitness, there is no need to separate body parts on any given day. You can train your entire body, 3 to 4 times a week, performing two to 3 exercises per body part, with 12 to 15 reps per set. How Long Should I Wait Between Sets? How Many Reps Should I Do?